Preconceived ideas lead to big data failures! 7 December 2014 is the 53rd anniversary of the Japanese attack on the US Naval base at Pearl Harbour that brought the United States into the Second World War. It is Sunday – just as it was 53 years ago. The attack saw the Japanese strike a significant blow against the US Pacific fleet sinking and severely damaging all 8 US battleships and a number of other vessels. The United States had broken Japanese diplomatic codes, although Japanese military codes remained secure. On 3 December 1941 US Intelligence intercepted a diplomatic message from Tokyo instructing its embassy in Washington to destroy codes and other secret equipment – a likely precursor to war. Yet, available evidence supported US bias against the idea of a Japanese attack on Pearl Harbour. 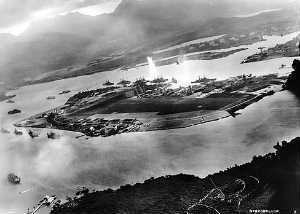 The base at Honolulu was heavily defended and was regarded as a deterrent to Japanese aggression. Various reports and sighting showed heavy concentrations of Japanese shipping heading South, towards the Phllippines. Previous experiences has lead Intelligence officials to assume that the blanket radio silence adopted by the Japanese carrier fleet meant that they were safely deployed in Japanese home waters ( The Intelligence Failure of Pearl Harbour), acting as a defensive screen. The attack, when it arrived at approximately 7:45am that fateful Sunday morning, was a complete surprise! On 5 December 1941, Japanese spy, Takeo Yoshikawa, reported that the US carrier fleet had left the port at Pearl Harbour. The battleships of the US Pacific Fleet were the primary targets for the attack, due to the Japanese preconception that their loss would so shock the American people that they would have no will to continue to the war. The missing aircraft carriers were deemed unimpartant, and teh attack was allowed to continue. Hindsight shows that they were wrong. The US carrier force would strike a decisive blow at Midway just 6 months later that would put the US well on the road to eventual victory. Both the United States and Japan had preconceived ideas that shaped their interpretation of the available data,. In both cases they were wrong! Do you, or your executives, make decisions driven on data, or do you twist the data to fit your preconceived ideas?